Situated on 18 lush tropical acres, just a tee shot away from the championship Old Blue Golf Course, this resort is ideal for a golf getaway or a quiet retreat. 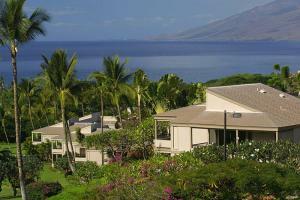 The fully furnished one- and two-bedroom condominium residences offer unmatched views of lush fairways and Maui's neighboring islands of Molokini, Lana`i and Kaho`olawe. With Wailea's five dazzling beaches and the Shops at Wailea nearby, you will find plenty to keep you busy during your stay. Located next to the greens and fairways of the Wailea Golf Club, this Maui condo village is a mile from shopping in central Wailea. Barbeques on site and many restaurants nearby. Wailea Golf Club and Blue Golf Course, Wailea Tennis Club, Humpback whale education center, Maui Ocean Center, Tropical Plantation.